Natasha is a freelance fashion and beauty illustrator. Her clients include globally renowned brands like CosmoGirl, NYX, Benefit Cosmetics, L’Oréal and many more. 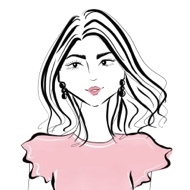 She specializes in timeless and elegant fashion illustrations using both, traditional and digital media.